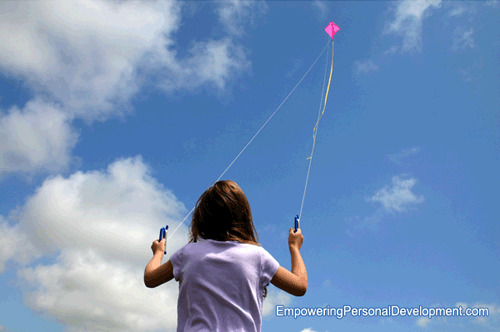 "Fly a Kite" is an image to describeInner child work is popular these days, and familiar to most persons, especially those who are focused on personal growth. but who shall command the skylark not to sing?" I tend to expand inner work beyond just the "child" and recognize that all the ages you've ever been still exist in you. Also, all the memories and thoughts and emotions you've ever had are still in your energy field. Further, all the experiences your soul has had in other dimensions are also part of who you are today. And still further, you're impacted by ancestors, siblings, and society in general. So, when I said I "expand" the concept of the "inner child" work, I wasn't joking. With my gift of non-ordinary sight and hearing, I have access to all these aspects in a client. Deep transformation happens more smoothly when all the parts are in harmony. Resistance can come from any level. I also find that using imagery and playfulness can assist a client to understand himself or herself better. Imagery can be a wonderful form of needed distraction to help someone to let go of a problem, feel better, and then gain insights about the subject itself. I have the honor of working with a powerful woman on a regular basis. I'll call her Kathy so I can talk about her experiences more easily. Kathy is an organization development consultant who works with groups of people in the change process. For a long time, Kathy had been aware of her inner child, a ten-year-old she calls "Little Kathy." Her awareness was, however, rather intermittent, peaking in sessions with me and others with whom she works. I do my energetic check-in* with Little Kathy almost as frequently as I check in with Kathy. Sometimes Kathy specifically asks me how I'm perceiving Little Kathy. In one session I said, "today she has on a pretty yellow dress and is playing quietly in the back yard, waiting to go to a party." Another time I said, "I see her sitting in the corner. She's telling me that she's scared and doesn't want to do something." Kathy connects my perception of Little Kathy with her own feelings. To my second observation, Kathy immediately said, "Oh, that's so right, I really don't want to do that contract. I was thinking I was just tired and lazy." Recently, Kathy experienced a series of challenges. In one of my check-ins, I noticed that Little Kathy was despondent. She had been crying because she felt abandoned. I talked with her. She lightened up slightly. Kathy had totally forgotten her. My attention to Little Kathy was helpful to Kathy. It might be compared to a telephone call from an aunt living two thousand miles away who cares that a little girl's mother has forgotten to pick her up at school. The aunt is reassuring and loving, but can't take any action to rectify the situation. In our next session, I told Kathy about this incident. She appreciated my attentiveness to her inner child. It helped her to remember to be more attentive to this part of her that experiences all sorts of emotions — joy, fear, grief, excitement. Months later, in a check-in, I noticed Little Kathy playing with a kite. I watched her with interest. She wrapped and unwrapped the ball of string with her little hands, keeping one eye on the flying kite. And then suddenly, she let the kite take her into the air. She was flying a kite! For the first time I experienced "go fly a kite" as a double-entendre. In our next session which was on the following day, I asked Kathy what she was doing the previous afternoon at the time of my check in. She said that she was giving a lecture that she was thoroughly enjoying. She was entranced by the interplay with the audience. She even had outlined a book she is now writing. * An "Energetic Check-in" is a process I use with all my clients. For thirty days following a session, I check the client's energy field at least three times a day. I notice alignments and continue the clearing process, although I never interfere in the client's life. © 1995, 2007 Marshall House. Jeanie Marshall, a Personal Development Coach specializing in deep transformation and personal success, writes extensively on subjects related to personal development and empowerment. She has developed http://www.empowering-personal-development.com to encourage you on your path.